We made these earrings 10 years ago for a client who has since sold them back to us, and we were glad they did! The halo-style earrings center on a pair of vibrant blue Sapphires. These particular stones are important for two reasons: first, they have the textbook blue velvet color and second, they are Burmese in origin. The mines that produce Burmese blue Sapphires are famed for the high quality stones they produced. 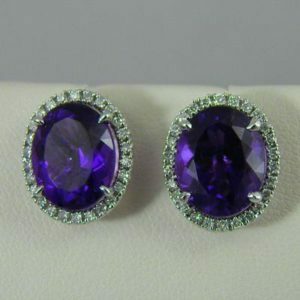 The rarity of these stones make these earrings a true collectible. 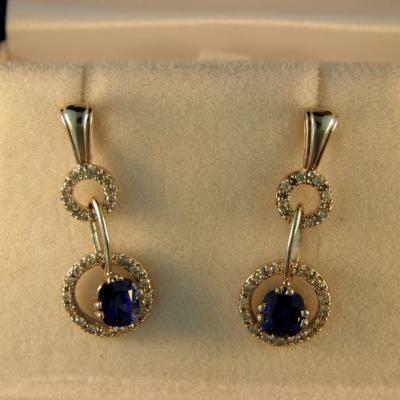 Details: 14k white gold earrings with 1.80cttw cushion cut Burmese blue Sapphires and .60cttw diamond accents. This unique item sold. 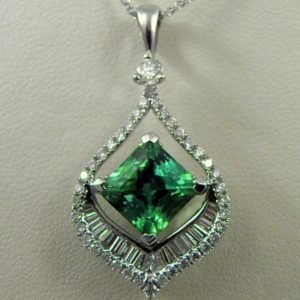 Please contact us for pricing and availability of similar pieces. Federal Way Custom Jewelers has served the people of South King County from the community of Federal Way, Washington for over two generations. The store was opened in 1955, and it remains today the oldest continuously operating jewelry store in the region.